Juanita Leon said the La Silla Vacia staff publishes five pieces per day, no matter what. Photo by Gabriel Cristóver Pérez of the Knight Center for Journalism in the Americas via Flickr CC. Launching a news publication online is the easy part. Paying the bills and surviving for several years is the hard part. Three of those who have evolved and survived for at least five years are La Silla Vacia, a political website in Colombia, Homicide Watch, a news and data platform in three U.S. cities, and the Texas Tribune, a news site focused on Texas civic life. It often takes at least four iterations for a digital initiative to gain traction, according to Michael Maness, vice president of the Knight Foundation’s Journalism and Media Innovation program. Maness moderated a panel recently in which the editors told their stories at the International Symposium on Online Journalism at the Knight Center for Digital Journalism in the Americas in Austin, Texas. Juanita Leon, founder and publisher of La Silla Vacia (“the Empty Chair”), said that her team of four journalists aims to cover how political and business power are exhibited in Colombia. It would be quite easy to go bankrupt doing investigative journalism in Colombia, she said, because it offends so many of the people and organizations who have the resources to be sponsors or advertisers. So she considers it a success that in the five years of the site, she has had two babies and has not had to sell her car to keep the operation going. Juanita Leon said her staff publishes five pieces per day, no matter what. Photo by Gabriel Cristóver Pérez of the Knight Center for Journalism in the Americas via Flickr CC. La Silla, as it is called for short, averages about 500,000 unique users a month. The staff writes five original stories a day, hosts a debate platform and publishes 15 blogs. Leon sees La Silla as a laboratory to test innovations in the production and distribution of news. They have experimented with new story forms and databases, such as one that traces connections among powerful families and political figures. They have had many scoops, won international awards and had impact far beyond the newsroom. A national survey of opinion leaders showed it is the third most-read website in the country. how you see yourself matters — are you a community service or a business? Colombia has lived through decades of armed conflict between left-wing and right-wing groups, so managing the comments section of La Silla has been tricky. Commenters have to register with their real names and agree to rules of civility. Laura Amico, CEO and founder of Homicide Watch D.C., has a similar story of living close to the edge financially to keep her entrepreneurial venture going. Her original idea was to understand her neighborhood better by investigating how it is affected by violence and how the criminal justice system functions. She decided to track every homicide case through the D.C. justice system, from the perspective of the victims, the suspects, the investigators, the prosecutors and the convicted. She told how she and her husband, Chris, a data journalist and computer programmer, cut back drastically on dining out and socializing so that they could fund their project. A year ago, she and her husband moved to Boston so she could study at Harvard on a Nieman-Berkman Fellowship. With Laura gone, who would run Homicide Watch? They ran a Kickstarter campaign that raised $47,000 to pay a staff of student interns to keep the operation going. She now is using the site as a platform to train young journalists to cover the criminal justice system. Most of the revenue for the operation comes from licensing the data-tracking software to the Chicago Sun-Times and the Trentonian, which also have Homicide Watch operations. 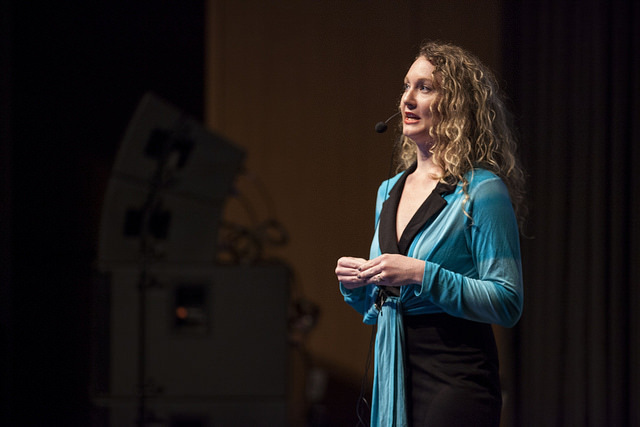 Homicide Watch D.C. Laura Amico addresses the ISOJ 2014 crowd. 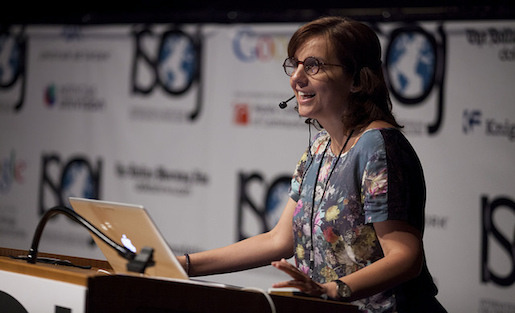 Photo by Gabriel Cristóver Pérez of the Knight Center for Journalism in the Americas via Flickr CC. She and her husband are now expanding their concept of structured journalism coverage to education, with the help of WBUR in Boston, the Knight Foundation and the Boston Foundation, as described here by NiemanLab. What keeps her going, she said, are the comments on the website, such as when a family member of a homicide victim offers thanks for showing their loved one as a person, not just a crime statistic. The Texas Tribune story is not one of bootstrapping but rather of developing a business model for watchdog journalism. 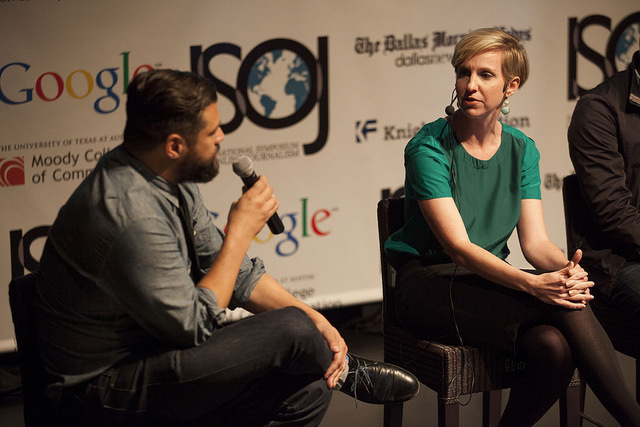 Editor Emily Ramshaw told the attendees at ISOJ that the journalism model and the business model have evolved since the Trib launched in 2009 with seed funding of $4 million. At that time, it had a staff of 29; today it has a staff of 40. “From the beginning, we have focused on data that would be searchable,” she said. They started with a database of public employee salaries, which was tremendously popular. They have since expanded the data offerings to include information on public schools, water usage, lobbyists and campaign finance. The data drives much of the traffic to the website. At the Trib, events are just as much journalism as a story produced by their writers, Ramshaw said. Photo by Gabriel Cristóver Pérez of the Knight Center for Journalism in the Americas via Flickr CC. Texas Tribune had 570,000 unique visitors and 3.1 million page views in February. The audience is 91 percent college graduates; 51 percent have an advanced degree and 52 percent have income of $100,000 or more. The Trib, which is a not-for-profit organization, gives away its content free to other news organizations, including television packages for local stations. They have created widgets that other media can use on their websites to track election results, for example, in their local coverage areas. Expenses totaled $4.7 million last year, so the operation generated a healthy surplus. Events have become a huge part of their budget, generating about $1 million in 2013. The annual Texas Tribune Festival lasts several days and has 2,500 paying attendees. The publication also runs free breakfasts around the state in which public officials are interviewed by the Trib’s reporters and editors. The next innovations include newsletters focused on particular topics such as water usage, public education and possibly, transportation. The key is to keep evolving. This is an edited version of a post that appeared on the The International Journalists’ Network’s site, IJNet.org and before that, on the blog News Entrepreneurs. IJNet helps professional, citizen and aspiring journalists find training, improve their skills and make connections. IJNet is produced by the International Center for Journalists in seven languages — Arabic, Chinese, English, Persian, Portuguese, Russian and Spanish — with a global team of professional editors. Subscribe to IJNet’s free, weekly newsletter. You can also follow IJNet on Twitter or like IJNet on Facebook.